Whether you are looking for a low-key and understated anchor for your seating group or leaning into a contemporary and loft-worthy aesthetic in your space, this essential End Table is an elegant piece for your aesthetic. Made from pine wood with clean lines, open square silhouette, and antique mocha brown finish, this End Table will be an unassuming addition to your room. Its open lower shelf is great for displaying decors, while the spacious tabletop is a perfect platform for remotes and coasters, a vase of fresh flowers, or a stylish lamp. 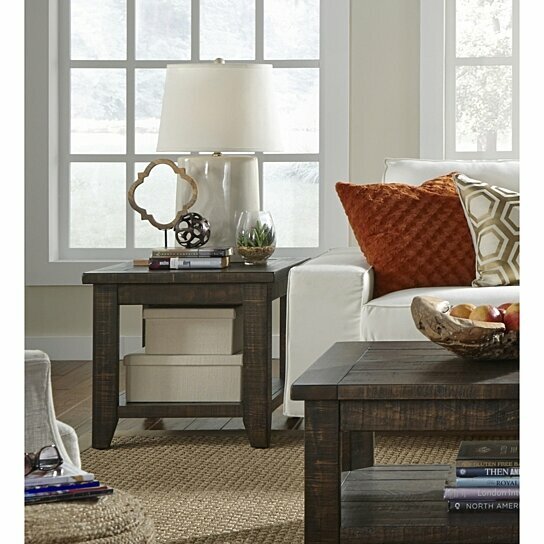 Set this End Table next to your sofa and transform your living room into a rustic utilitarian aesthetic. Note: Other featured items in image except this end table are sold separately. The table features an open lower shelf that is great for displaying decors. Made from solid pine wood this table will ensure long term utilization. The table is a perfect pair for a classic arm chair.